Notice anything new about my webpage? EVERYTHING!! I updated my webpage with a new background and graphics, removed my old data, and checked and edited all my book purchase/review links. I also revised my tagline from “Celebrating Romance Across the Ages” to “Risqué Tales of Romance, Adventure & the Paranormal” which better reflects my writing plans for the future, while covering most of the past. Even my new signature graphic reflects my writing plans and matches my webpage (Check it out at the end of this post). While I LOVE history and enjoy the research, I find myself watching paranormal stories – even the bad ones. I admit to geeking out on current stellar paranormal shows like Supernatural, Dark Matter, The Librarians, and Grimm to some not-so-stellar monster and shark movies, including the Sharknado series and ALL of SyFy’s recent Shark and Monster Week. What are your paranormal favorites? Shared Whispers is an anthology of short stories from an international group of fifteen authors who are published by Champagne. Whether romance, suspense, mystery, thrillers, paranormal, fantasy, or science fiction stories, romance is the common theme. My contribution was Nimue’s Daughter. a contemporary Arthurian apocalypse tale. Check out the excerpt. Her breath caught at her first sight of the man. He didn’t meet her standard of male pulchritude but he was so attractive that she was compelled to stare. Wavy black hair worn a bit too long, ice-blue eyes that hinted he knew everything about her at a glance, and an endearing, crooked smile. Perhaps she needed to change her standard of male pulchritude. He appeared a bit thin and perhaps a little confused. She knew all of her mother’s friends and he was not among them. A stranger, then, that Mother had brought home in this dangerous time. “Mother, Aunt. I’m glad you arrived home without incident.” She hugged each in turn. The man had moved closer and still hadn’t taken his eyes off of her. The question seemed to put off Aunt Rhiann. When she hesitated and looked toward Mother for rescue, the man held out his hand. Nimue grasped it and wished she hadn’t. Attraction vied with lust. She tried to pull away. He held tight, then branded her hand with a sizzling kiss. She wanted to scrub her hands clean, to deny what had passed between them. Click cover or HERE to buy Shared Whispers for $3.95. It’s been a while, but I’m in the middle of writing a sequel and preparing for two book releases this Tuesday (September 3rd). Finding Eve is the second of my Lyons’ Tales shapeshifter novellas. It is absolutely a stand-alone read. I personally hate to read the second or third book in a series and find that I have no clue what’s going on. Thank you to my editor extraordinaire, Nikki Andrews, who gives 100% on every paragraph with a cyber-smile. Thanks also to Trisha Fitzgerald for her magnificent cover. You can check out the cover on the left and click to read the blurb and an excerpt. The buy link will be active Tuesday. Also released is Shared Whispers, an anthology of fifteen stories by Champagne authors. Check out the cover on the left, click to read the blurb and an excerpt of Nimue’s Daughter, a contemporary Arthurian fantasy in which Merlin battles the Armageddon. When I was writing about my hometown military romance, Search & Rescue (see graphic on left), I ended with the story of a mullet fry–an all-day group fest. 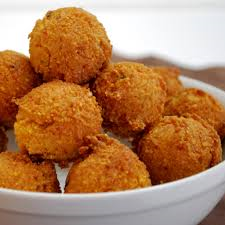 Today, I’m sharing my favorite recipe for Hush Puppies which are deep-fried with the fish. Tomorrow, I’ll post my personal tartar sauce and remoulade recipes for seafood. Preparation: Mix dry ingredients. Add onion, corn, and Jalapeno pepper (if desired). Mix well. Add milk for consistency, if needed. Drop by tablespoons into deep hot fat, about 360°. Fry until golden brown. I’m running a ‘Name that Character Contest’ for my contemporary fantasy short story Nimue’s Daughter. It’s a rescue from Armageddon based on the Arthurian mythology. It’s also a work in progress for Shared Whispers, the freebie anthology from Champagne authors that will be published and available for free download in January. There’s a blank in this excerpt and throughout the entire story where Nimue’s cousin’s name should be. She’s the major secondary character in the story. She’s a feisty, red-haired Celtic lady who refuses to accept the terrorists’ inevitable Armageddon without a fight. Please give her a name. Leave your entry in a comment for this post. The winner’s name can be included (your choice) in the acknowledgement. Winner will be announced on Monday, September 24th at ritabay.com. The clarion call sounded, jolting Myrddin from his healing sleep. He sat bolt upright and sucked in a deep breath—and a mouthful of dirt. He held out a hand expecting a drink. Nothing. He forced open one crusted eyelid, then the other, and saw only darkness—total, pitch black darkness. He curled his hands into fists. Vast power coursed through his body, even dripped from his fingers, but a sense of foreboding nagged at him. He used a bit of power to cast a light into the depths of the cave that had served as his resting place. Empty, long-deserted. He held up an arm to the light. Filthy and bare. His elegant embroidered tunic lay in faded tatters on the ground around him. He was naked, his body crusted with dirt. His hair and beard fell below his waist in a tangled mass. He struggled to stand but fell to his hands and knees, too weak to rise. Foreboding yielded to panic. There should have been abundant light and fresh air, novices to tend him after his long sleep, and senior priests and priestesses assembled to welcome him. Most important of all, there should have been …Who? His memory failed him. He pushed himself to his feet and staggered across the floor of the cave to the entrance that had been sealed … How long ago? A wave of his hand tossed the boulders sealing the cave tumbling down the mountainside. He clung to the opening of the cave and surveyed the vast, empty expanse of stone. Then he remembered. She should have been here. He croaked her name, then licked his lips, swallowed, and called again. Two crones dressed in long white robes rounded a boulder and stopped dead at the sight of him. He felt their fear, their panic. They were about to depart, leaving him stranded. He hadn’t understood a word of their language but had recognized a name. No response. He tried again in the languages of the Cymry, the Gaels, and the Picts. Nothing. He lowered himself and addressed them in the language of the accursed Romans. He couldn’t understand them but they were discussing him and had mentioned Nimue. They had failed to offer him the proper deference due his rank or even the hospitality due strangers and were considering leaving. He raised his hand and the women were suspended several feet in the air. He held them there for a few moments as they kicked and cursed, then gently lowered them to the ground.